If you want to park near the terminal for an hour, doing so at OR Tambo airport in Johannesburg will cost you double what you'd pay at secondary airports such as Port Elizabeth or East London. But for long-term parking, say this long weekend, OR Tambo is cheap – while Cape Town airport's long-stay parking will be the price of another whole plane ticket. For the best parking deal at the airport you want a smaller city, our comparison shows, just not too small. * This article has been updated with comment from the Airports Company of SA. If you leave your car at the Port Elizabeth or East London airports this long weekend it'll cost you R250, and you'll pay only slightly more to park at OR Tambo. But leave your car at Cape Town International Airport and you'll pay R774 – the price of a flight between Cape Town and Johannesburg if you get a decent deal. Meanwhile you'll pay a mid-range R379 to leave your car at the airport in George, Upington, or Bloemfontein, as long as you're willing to leave your vehicle at the mercy of the elements in open parking. Opt for covered parking and you'll need an extra R176 to buy your way out at the parking machine when you return. We compared the cost of parking at South Africa's ten most popular airports for short-stay close to the terminal building and for the cheapest long-term parking on the airport premises, excluding pre-booked slots and off-premises alternatives. 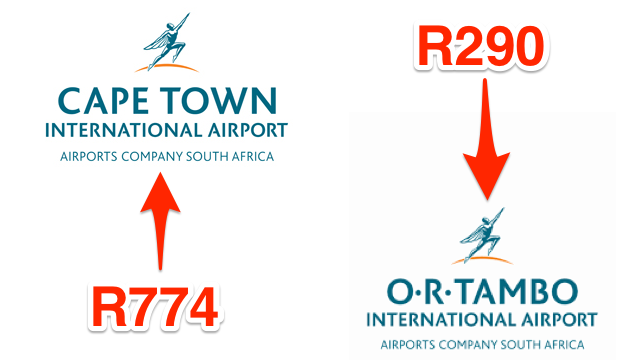 Even though nine of those airports are controlled by the Airports Company of South Africa (Acsa), the prices are wildly different across South Africa. 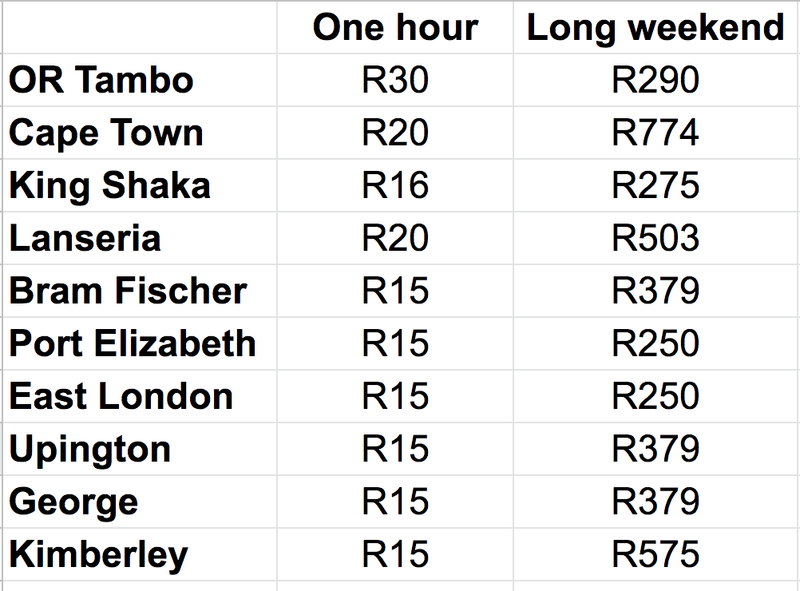 For one hour of parking OR Tambo in Johannesburg is the most expensive at R30, double what you'll pay at smaller airports. But for long-term parking OR Tambo is relatively cheap – especially compared to Cape Town, which is slightly over 2.5 times more expensive. Our comparison suggests that you'll want to look at public transport or an e-hailing service if you'r flying out of Cape Town, or Kimberley. And if you're flying out of the independently-owned Lanseria to save money on the plane ticket, you'll want to factor in the R483 extra you'll pay for parking over the long weekend. Where multiple parking lots are available, short-term parking is based on that located closest to terminal buildings, and long-weekend prices are based on the cheapest available on-premises lot. The long weekend price is calculated from 6PM on Wednesday to 8AM on Monday, a duration of 4 days and 14 hours. 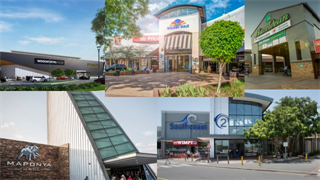 At King Shaka in Durban, Lanseria in Johannesburg, and Kimberley long-term parking is only available for 24-hour slots or part thereof, so prices are for five full days. At Bram Fischer in Bloemfontein, Upington, George, and Kimberley, the cheapest available parking is open. Covered parking is R555 at all of those. In response to questions on the disparity in fees between different airports, Acsa provided the following statement on its calculations of parking fees. A variety of considerations, some of them specific to each airport, are used in assessing parking fees. These considerations include, but are not limited to, demand and usage, proximity to terminal buildings, cost of services such as security, maintenance costs and the original cost of building the facility. Parking areas closer to terminal buildings are in higher demand and priced accordingly. The nature of this demand is such that there is a significant group of airport users that needs parking close to the terminal building while waiting for passengers and a quick exit thereafter. These areas are therefore not intended for long-term parking and are priced accordingly. At O. R. Tambo International Airport, for example, the long stay rate is currently R58 per day conditional on a minimum stay of three days or where booked online five days in advance. At R58 per day, that works out to R2.41 per hour. O. R. Tambo International Airport also has additional facilities at Parkade 2 South and the Parkade 1 Basements. Hourly rates at these two parking areas equate to R7.08 per hour. At Parkade 2 North the fee is R5 per hour. Cape Town International Airport’s long stay rate is R60 per day conditional on a stay of five days. Shade parking has a long stay rate of R120 per day, also conditional on a stay of five days or more. At R60 per day that works out at R2.50 per hour. The rate at the Parkade when calculated as an hourly rate is R8.17 per hour, whilst shade is tariffed at R6.67 per hour. King Shaka International Airport’s long stay rate is R55 per day conditional on a stay of five days or longer and results in being charged R2.29 per hour. The structured parking reflected as an hourly rate is R7.08 per hour whilst the shade is at R3.54 per hour. Our six regional airports have exactly the same rates and with the same tariff bands. These rates were standardised from 1 April 2018. Regional airports rates for long stay is R50 per day with a prequalifying 3 day stay and R4.79 per hour whilst open parking is at R3.13 per hour. 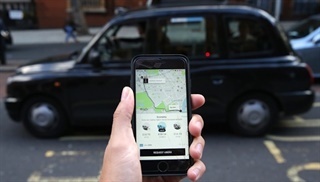 The numbers of conditional or pre-qualifying days were designed following a study that looked at 90% of the people that park for longer than ‘x’ period. We arrived at parking fees designed to maintain 90% usage. In our view, and considering the above, the rates are all within close proximity of each other with no outliers.